Hello! Welcome to True Shot Chihuahuas. My name is Andrea Carter. I live in Southern Illinois. I should begin by confessing that years ago I would have told you I don't like little dogs. I had owned large breed dogs my entire life, and was convinced little dogs were yappy, rotten, obnoxious, little twerps that could not possibly play rough with me, handle my active lifestyle, go hiking, etc. A little over a decade ago, I found myself in the company of two such dogs, or so I had thought. Bullet and TeeTee came to me from a local friend and I was certain from the start I had made a mistake. I had always wanted to breed dogs, but wanted to have the time and resources to be responsible... and I had never found a breed that intrigued me enough to have that many of them! So when a pair of chihuahuas came along, I was skeptical. But I decided to give them a shot, and welcomed them into my home. rough, tough, independent, loyal, protective, goofy, and wonderful! The longer I had them the more I had to know. My original plan was to breed a litter and see how it went, but as time moved on, I found myself too in love with the breed to simply "Have a litter of puppies". There's a lot of work and research that goes into producing a litter of quality, healthy animals that are capable of helping to improve the gene pool of the breed as a whole. I started finding out more and more about the AKC breed standard, the health issues, genetic defects, and the benefits of genetic testing, nutrition, behavior, training, etc etc... and realized I'd like to get involved with improving the breed and educating as many people as possible about them. While my dogs are bred for breed standard physically, they are also chosen for health and vigor, and breed standard temperament with a focus on the pleasant, family oriented side. I feel temperament is very important. While a sassy, independent little dog is a lot of fun, they should also be easy to live with. Its important you understand, I do not breed pets. I breed chihuahuas to improve the quality of the breed as a whole and preserve the breed standard. My goal is to improve on my breeding stock and continue the work I have done so far in achieving a genetically healthy, physically sound animal with correct breed type and temperament for generations to come. I am not trying to provide pet animals. When puppies are born in any litter, not all of them will turn out to be what I was looking for when the breeding was planned. In the event I produce puppies that are not what I hoped to get from a specific breeding, those puppies become available to pet homes. Be careful when looking for your next chihuahua! Anyone who tells you they breed show quality dogs and yet have never shown one of their dogs is highly likely dishonest! If a breeder claims to have dogs that are "show quality" ask to see the pedigree that confirms this. A dog that has been shown successfully and reached the title of Champion will have a CH in front of its name on a pedigree. A "show quality chihuahua" will have champions in its pedigree somewhere, will come from a household that is actively showing or was actively showing their dogs, or be a very lucky dog indeed! I often hear people talk about "Teacup" chihuahuas. Hopefully by now most of us realize there's technically no such thing, however if you say teacup everyone knows what you're referring to. I do not breed specifically for tiny little chihuahuas. I do occasionally have them show up in litters. I prefer to aim for dogs who at adult size stand between 3 and 6 lbs. I strive to produce small, cobby, medium-short muzzled appleheads with endearing expression who have what it takes to survive life with an active family. While I know many teeny little chis can handle this, often they cannot. Often these little "designer chis" have so many health problems they are confined to a sad life being carried about until they pass away at an early age leaving heartbroken owners behind who had no idea what they were getting into. I'm more likely to produce a spunky little fellow that can keep up with kids (provided they're old enough/mature enough to be trustworthy around a very small, and breakable dog), and keep up with an on the go, active lifestyle. Please, PLEASE research this breed before you buy! You need to find a breeder who can PROVE to you their dogs have no history of heart murmur or luxating patellas, two afflictions common to chihuahuas. Doing your homework can save you thousands of dollars in surgeries and prevent you from losing your beloved family member 10 years before their expected lifespan ends! I have been working closely and in tandem with my dear and close friend Melanie Bowling of Isa's Chihuahuas. Melanie and I hope to consistently present some lovely dogs with great structure and movement with rock solid temperaments to you. 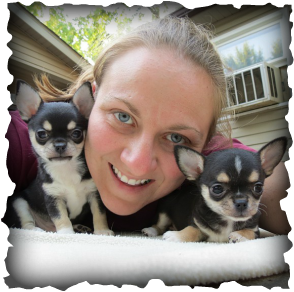 As well as Annette and Annalisa Waldkoetter of Windsong Chihuahuas. Windsong is known for decades of sound, sturdy dogs with lots of substance and fluid movement. We hope to have a long and wonderful relationship with these lovely ladies and produce some great dogs that will be an asset to the breed for years to come. We have a great deal planned for the future at True Shot, and I hope to make an impression with the wonderful temperament and structure of the dogs I produce. and yours to be as successful as possible in hopes we can continue to raise the bar on the chihuahuas we see at shows. I see it as a step forward for the breed, not one back for me personally. 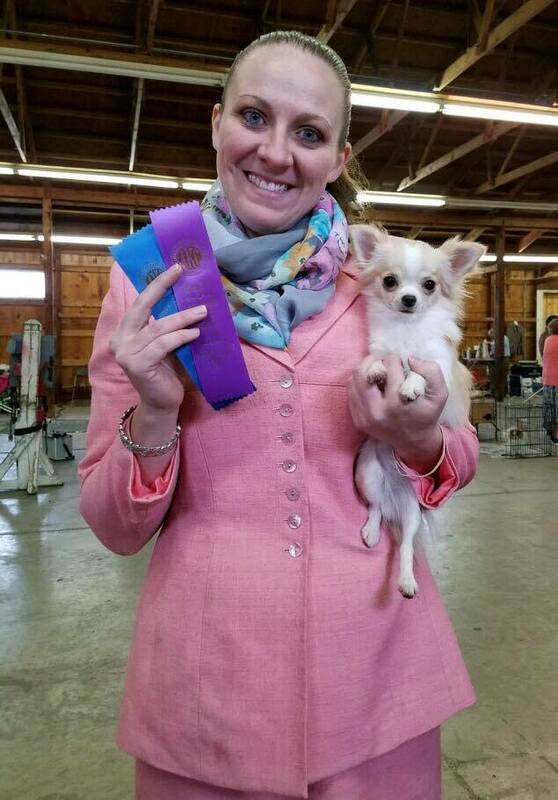 I hope to continue this attitude throughout my show career and sincerely hope to bring a positive and fun personality to the chihuahua show ring. I look forward to meeting you and hope we can work together to improve the breed as a whole. I am a professional show dog handler, and travel the country with my dogs and client dogs earning AKC Championships. If you're interested in having me handle a dog for you, please click the link in the menu above under the "More" tab for True Shot Handling for more information. If you see me at a dog show, I may look busy, and may have to get to a ring, but I'd love to talk dogs with you when I have a spare moment. I would love to see the public view of the applehead chihuahua clarified and improved through proper factual education and the introduction of physically sound, breed standard dogs with sound mental character into the homes and hearts of loving dog owners nationwide. Come visit our dogs and see what I mean! I prefer to let my loving, social, active, healthy, crazy, zaney, cocky bunch speak for the chihuahua breed themselves. Once you meet them you'll fall in love... and you won't regret it.